Cover artwork: Wiesbachhorn Mountains, Tyrol, Austria. Bruckner’s three mature Masses, in D minor, E minor, and F minor, were written between 1864 and 1868, after his seven-year period of grinding study with Simon Sechter, during which he composed very little. When he eventually plunged into composition again (he was now in his forties), Bruckner had consolidated his skills, and the D minor and F minor Masses show a maturity based on the Austrian Classical tradition. The E minor stands apart; it uses a wind band instead of the Classical orchestra, and it is clearly influenced by a study of early counterpoint, especially Palestrina’s. Of the three Masses it is the ‘purest’. It also looks to both past and future in a way the others do not. 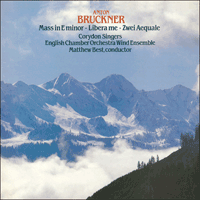 At this time of his career, Bruckner’s sense of movement in his large-scale music reflected the Classical era; the Masses in D minor and F minor (as well as a less characteristic earlier one in B flat) are modelled on the symphonic Masses of Haydn and Mozart, with Beethoven and Schubert looking on. Bruckner had not yet explored the vast, slow timescale of his later symphonies. He had begun to discover Wagner, who had found a way to create musical processes slow enough to accommodate stage drama, and Bruckner was to become the first and greatest composer to apply such a timescale to purely instrumental music. (This is the only respect in which Bruckner is a ‘Wagnerian’ composer.) But in their sense of movement, the works of the 1860s—two symphonies (Nos ‘0’ and 1) and the three great Masses—do no more than hint at a new road, though they all have potent individuality. The E minor Mass of 1866 was revised in 1882, the version recorded here. Bruckner’s lifelong addiction to revision, under pressure from his well-meaning but mistaken Wagnerian friends, is one of the sadder stories of music, but the Masses did not suffer seriously from it; although there are inauthentic scores, Bruckner’s own revisions are plainly advantageous. The E minor Mass received improvements that cannot be compared with the disastrous meddling inflicted by the distracted composer on its contemporary the First Symphony in 1890–91. In his symphonies Bruckner had entered a world few people (and sometimes not even his own great mind housed in a naive personality) fully understood, while the Masses could be related to familiar norms. The revisions of detail in the E minor Mass do not alter its nature, its fine balance between forward and backward views. The concern with slow, floating counterpoint, while it refers to Palestrina, yet anticipates the deliberation of Bruckner’s own later processes, and the work conveys a sublimity inaccessible to its companions in D minor and F minor, admirable though they are. This can be felt at once in the opening Kyrie, largely unaccompanied except for the intermittent use of horns and trombones. Long suspensions and clear harmony create a sense of space. In the central section, ‘Christe eleison’, there is more movement, and a climax; then the Kyrie returns, this time to make its own climax before fading into vaulted heights. The Gloria and Credo, on the other hand, are essentially Classical allegros with the contrasts of tempo and style dictated by the text. For the most part Bruckner is revelling in the athletic energy familiar to his great predecessors Haydn and Beethoven, but with textures simpler and more spare and rhythms blunter and more naive. Both movements are in C major and contain central contrasts, the Gloria having a quiet section at ‘qui tollis peccata mundi’ with typical horn phrases, and the Credo a simple but profound treatment of ‘et incarnatus est’ and ‘Crucifixus’, a stream of perfectly formed, dignified melody of great beauty. The Gloria ends with a short but trenchant chromatic fugato on ‘Amen’, and the Credo (whose main theme anticipates strikingly the sturdy power of the Scherzo of the Eighth Symphony of more than twenty years later) reaches its apex in a broad and mighty cadence. It is in the Sanctus that Palestrina’s influence (in the form of a quotation from the Missa brevis of 1570) is clearest. A two-part canon is enveloped in eight-part counterpoint as a great crescendo is built. The whole movement lasts only a few minutes but has a power of suggestion out of all proportion to its dimensions; such a slow crescendo as this begins some of Bruckner’s greatest symphonic movements, and the tribute to Palestrina is also a glance to the future, not only Bruckner’s own, but to such things as the magnificent opening pages of Sibelius’s Seventh Symphony. The gentle and subtle Benedictus is in full sonata form, its development deeply modulated and its coda a bright burst on ‘Hosanna in excelsis’. The final Agnus Dei delivers the customary threefold prayer, each time as a crescendo, the last quietened to make way for the hushed ‘dona nobis pacem’, perhaps the most beautiful music in the the whole work, which is without doubt the deepest and most concentrated of Bruckner’s Masses. The fine motet Libera me, for choir with three trombones, cello, double bass and organ, was written in 1854. Although this was before his long period of study with Sechter, Bruckner was no beginner; he was thirty, with plenty of experience of church music behind him; the story that he did not become a proper composer until he was forty is a myth. As early as 1849 he had produced a beautiful and individual little Requiem that ought to be better known than it is (it is recorded on Hyperion CDA66245), and his talents had already been recognized in his own environment. This Libera me is simple and clear; it contains no elaborate counterpoint, but its part-writing is excellent, as is the calculation of sonorities. It has the solemn dignity befitting a funeral piece, and its middle section expresses the fear of judgment with considerable power and economy. The two Aequale, for three trombones, are the earliest music on this record, belonging to 1847, when Bruckner was twenty-three. The second of the two pieces lacks a bass part, which has been supplied by Hans Bauernfeind. The unpretentious and serious harmonies could have been devised for a funeral or memorial service, and need the kind of spacious acoustic we find on this recording. Les messes en ré mineur, mi mineur et fa mineur de Bruckner virent le jour entre 1864 et 1868, en pleine maturité, après sept années d’études assidues auprès de Simon Sechter durant lesquelles il ne s’adonna que très peu à la composition. Lorsque à quarante ans passés, Bruckner se plongea finalement à nouveau dans l’écriture, il avait consolidé ses connaissances et son art. Les messes en ré mineur et fa mineur révèlent une maturité s’appuyant sur la tradition classique autrichienne. Celle en mi mineur reste à part; en place de l’orchestre classique, elle fait appel à une fanfare de vents et dénote l’influence de l’étude du contrepoint ancien, en particulier de celui de Palestrina. De ces trois messes, elle est la plus «pure». Elle contemple tant le passé que l’avenir d’une manière que les autres ne font pas. A ce stade de sa carrière, Bruckner faisait preuve dans ses compositions d’amples proportions d’un sens du mouvement qui reflète la période classique; les messes en ré mineur et fa mineur (ainsi que celle antérieure moins caractéristique en si bémol majeur) sont modelées sur les messes symphoniques de Haydn et de Mozart, avec des prémonitions de Beethoven et de Schubert. Bruckner n’avait pas encore exploré l’échelle temporelle vaste et lente de ses symphonies à venir. Il avait commencé à découvrir Wagner lequel était parvenu à créer un procédé musical assez lent pour s’accommoder de l’action scénique. Le premier, Wagner—qui était aussi le plus grand à cet égard—avait appliqué cette échelle temporelle à la musique purement instrumentale. (Il s’agit du seul aspect qui permette de qualifier Bruckner de compositeur «wagnérien».) Mais par leur sens du mouvement, les œuvres des années 1860—les deux symphonies (nos «0» et 1) et les trois grandes messes—ne sont qu’une vague prémonition du nouveau chemin à prendre, même si elles sont toutes marquées du sceau de leurs fortes personnalités. Ecrite en 1866, la Messe en mi mineur fut révisée en 1882. C’est cette dernière version qui a été retenue pour cet enregistrement. Poussé par ses amis wagnériens bien intentionnés, Bruckner éprouvait un besoin compulsif de réviser ses partitions. Et voici bien là un des éléments les plus tristes de la musique. Mais il faut admettre que ses messes n’en souffrirent guère, car même si ces partitions sont en quelque sorte inauthentique, les révisions de Bruckner sont à leur avantage. La Messe en mi mineur y reçut des améliorations qui ne peuvent être comparées aux retouches désastreuses infligées par le compositeur préoccupé à sa première symphonie en 1890–91. Avec ses symphonies, Bruckner avait pénétré un univers que peu comprenaient (et parfois pas même son esprit superbe habité d’une personnalité naïve), tandis que les messes pouvaient être rapprochées de normes familières. La révision détaillée de la Messe en mi mineur n’altère en rien sa nature, son équilibre plein de finesse entre les éléments qui tirent vers le passé ou poussent vers l’avenir. Elle repose sur un contrepoint lent et fluide qui tout en faisant référence à Palestrina anticipe l’avènement des propres procédés futurs de Bruckner. Cette œuvre traduit un sublime que celles en ré mineur et fa mineur ne parviennent à effleurer, aussi admirables puissent-elles être. On le perçoit d’emblée dans le premier Kyrie, une page écrite pratiquement sans accompagnement à l’exception de l’emploi passager des cuivres et des trombones. De longs points d’orgue et une harmonie claire créent une sensation d’espace. La section centrale («Christe eleison») s’anime jusqu’à un apogée, puis le Kyrie revient, pour atteindre son propre paroxysme avant de s’éteindre vers les sommets cintrés des voûtes. Le Gloria et le Credo, quant à eux, sont principalement des allegros classiques où les contrastes d’allures et de styles sont dictés par le texte. Bruckner savoure généralement l’énergie athlétique familière à ses prédécesseurs, Haydn et Beethoven, mais avec des textures plus simples et plus épurées, des rythmes plus carrés et naïfs. Tous deux en do majeur, ces mouvements dévoilent une section centrale contrastante, le Gloria possède une section plus calme sur «qui tollis peccata mundi» avec des phrases caractéristiques aux cors, et le Credo un traitement simple mais profond de «et incarnatus est» et «Crucifixus», une mélodie digne et fluide, parfaitement formée, d’une grande beauté. Le Gloria se conclut par un fugato concis mais tranchant sur «Amen» tandis que le Credo (dont le thème principal anticipe de manière saisissante la puissance solide du Scherzo de la huitième symphonie écrite vingt ans plus tard) atteint son paroxysme sur une cadence large et puissante. C’est dans le Sanctus que l’influence de Palestrina est la plus manifeste, sous la forme d’une citation d’une Missa brevis de 1570. Un canon à deux parties est enveloppé d’un contrepoint à huit voix alors qu’est élaboré un crescendo puissant. Le mouvement ne dure que quelques minutes mais possède un pouvoir suggestif qui outrepasse complètement ses dimensions. Voici un crescendo lent comparable à ceux qui débutent les plus grands mouvements symphoniques de Bruckner. L’hommage à Palestrina anticipe aussi l’avenir, non seulement celui de Bruckner, mais aussi les magnifiques pages d’introduction de la septième symphonie de Sibelius, par exemple. Doux et subtil, le Benedictus est de coupe sonate, son développement module beaucoup et sa coda éclate avec fougue sur «Hosanna in excelsis». L’Agnus Dei final délivre la prière usuelle à trois reprises, les deux premières marquant un crescendo tandis que la dernière s’apaise pour faire place à un «dona nobis pacem» murmuré. Il s’agit peut-être du plus beau passage de cette messe qui est sans aucun doute la plus profonde et la plus concentrée de toutes celles que Bruckner a écrites. Le superbe motet Libera me pour chœur accompagné de trois trombones date de 1854, précédant ainsi largement la longue période d’étude auprès de Sechter. Pourtant, Bruckner était loin d’être un débutant. A trente ans, il jouissait d’une longue expérience de musique liturgique. Ce n’est que pure fantaisie que de penser qu’il soit devenu un «vrai» compositeur à quarante ans, et à cet égard, l’histoire relève du mythe. Dès 1849, Bruckner avait produit un petit Requiem d’une grande beauté, d’une personnalité marquée, qui mériterait d’être mieux connu (il est disponible chez Hyperion, référence CDA66245). Ses talents étaient déjà reconnus par ceux qui l’entouraient. Son Libera me est simple, clair. Il ne contient aucun contrepoint élaboré, mais sa conduite des voix est excellente, ainsi que le jugement des sonorités. Il possède la dignité solennelle qui convient à une pièce funèbre, et dans sa section centrale, il exprime la peur du jugement avec une puissance d’autant plus exceptionnelle qu’elle est obtenue par une remarquable économie de moyens. Ecrits en 1847 alors que Bruckner n’avait que vingt-trois ans, les deux Aequale pour trois trombones constituent la musique la plus ancienne de cet album. Il manquait au deuxième une partie de basse qui a été réalisée par Hans Bauernfeind. Les harmonies sérieuses et sans prétention auraient pu être destinées à un service funèbre ou commémoratif. Elles requièrent une acoustique spacieuse à l’image de celle de cet enregistrement. Die drei Messen in d-Moll, e-Moll und f-Moll aus Bruckners reifem Schaffen entstanden zwischen 1864 und 1868 nach seinen sieben harten Studienjahren bei Simon Sechter, während derer er nur wenig komponierte. Als er sich schließlich wieder ins Komponieren stürzte (er war nun in seinen Vierzigern), hatte er sein Können vertieft, und die Messen in d-Moll und f-Moll zeugen von einer Reife, die auf der Tradition der österreichischen Klassik aufbaut. Die Messe in e-Moll nimmt einen besonderen Platz ein; in ihr kommt ein Bläserensemble anstelle des klassischen Orchesters zum Einsatz, und sie ist deutlich vom Studium frühen Kontrapunkts (insbesondere im Schaffen Palestrinas) beeinflusst. Von den drei Messen ist sie die „reinste“ und auf eine Weise sowohl vergangenheits- als auch zukunftsorientiert, wie es die anderen nicht sind. In dieser Phase seiner Karriere reflektierte Bruckners Sinn für die Bewegungsabläufe seiner groß angelegten Werke den Stil der Klassik; die Messen in d-Moll und f-Moll (ebenso wie eine frühere, weniger charakteristische Messe in b-Moll) haben die sinfonischen Messen von Haydn und Mozart zum Vorbild, mit einem Quäntchen Beethoven und Schubert. Bruckner hatte noch nicht die weit ausgedehnten, langsamen Zeitabläufe seiner späteren Sinfonien ausgelotet. Er begann Wagner zu entdecken, der einen Weg gefunden hatte, musikalische Prozesse so zu verlangsamen, dass sie sich dem Bühnendrama anpassten, und er sollte der erste und bedeutendste Komponist sein, der solche Zeitabläufe für reine Instrumentalmusik einsetzte. (Dies ist der einzige Aspekt unter dem Bruckner als „Wagnerianer“ bezeichnet werden könnte.) Aber in ihren Bewegungsabläufen deuten die Werke der 1860er-Jahre, zwei Sinfonien (Nr. „0“ und Nr. 1) sowie die drei großen Messen, einen neuen Weg allerhöchstens an, auch wenn sie alle höchst individuell wirken. Die e-Moll-Messe von 1866 wurde 1882 überarbeitet, und diese Fassung liegt hier vor. Bruckners lebenslange Manie der Neubearbeitung unter dem Druck seiner wohlmeinenden, aber verblendeten wagnerianischen Freunde ist eine der traurigeren Episoden der Musikgeschichte, aber die Messen haben nicht ernsthaft darunter gelitten; obwohl Partituren von fremder Hand existieren, erweisen sich Bruckners eigene Änderungen eindeutig als positiv. Die an der e-Moll-Messe vorgenommenen Verbesserungen sind nicht mit der verhängnisvollen Eingriffen zu vergleichen, die der irritierte Komponist der zeitgleich entstandenen Ersten Sinfonie in den Jahren 1890–91 zumutete. Mit seinen Sinfonien hatte Bruckner sich in eine Welt vorgewagt, die nur wenige Menschen (und zuweilen nicht einmal der große Geist, der in einer naiven Persönlichkeit steckte) in vollem Umfang zu erfassen wussten, während die Messen auf vertraute Normen bezogen werden konnten. Die Neubearbeitung von Details der Messe in e-Moll verändert nicht deren Charakter, ihr ausgewogenes Verhältnis zwischen vorwärtsweisenden und vergangenheitsbezogenen Auffassungen. Ihre Beschäftigung mit langsam schwebendem Kontrapunkt stellt zwar Bezüge zu Palestrina her, nimmt jedoch auch schon die Bedächtigkeit von Bruckners eigener späterer Herangehensweise vorweg, und das Werk vermittelt eine Erhabenheit, die seinen Gegenstücken in d-Moll und f-Moll, so bewundernswert sie auch sind, verschlossen bleibt. Dies ist gleich im einleitenden Kyrie zu spüren, das außer dem gelegentlichen Einsatz von Hörnern und Posaunen weitgehend ohne Begleitung auskommt. Lange Vorhalte und klare Harmonik schaffen ein Gefühl von Weiträumigkeit. Der Mittelabschnitt, „Christe eleison“, wirkt bewegter und enthält einen Höhepunkt; dann kehrt das Kyrie zurück, um nun selbst einen Höhepunkt darzubieten, ehe es in hohen Weiten ausklingt. Gloria und Credo sind hingegen mit ihren vom Text diktierten Kontrasten in Tempo und Stil im Grunde klassische Allegri. Meist schwelgt Bruckner in der energischen Kraftentfaltung, die seinen großen Vorgängern Haydn und Beethoven so geläufig war, aber mit schlichteren, kargeren Texturen sowie derberen, eher naiven Rhythmen. Beide Sätze stehen in C-Dur und enthalten zentrale Kontraste—das Gloria verfügt über einen leisen Abschnitt auf „qui tollis peccata mundi“ mit typischen Hornphrasen, und das Credo weist schlichte, aber profunde Umsetzungen von „et incarnatus est“ und „Crucifixus“ auf, eine Flut perfekt geformter, würdevoller Melodien von großer Schönheit. Das Gloria endet mit einem kurzen, aber prägnanten chromatischen Fugato auf „Amen“, und das Credo (dessen Hauptthema eindrucksvoll die solide Kraft des Scherzos der mehr als zwanzig Jahre später entstandenen Achten Symphonie vorweg nimmt) erreicht ihren Höhepunkt mit einer ausgedehnten und mächtigen Kadenz. Im Sanktus wird Palestrinas Einfluss am deutlichsten (in Form eines Zitats aus der Missa brevis von 1570). Ein zweistimmiger Kanon wird von achtstimmigem Kontrapunkt umfangen, als ein großes Crescendo aufgebaut wird. Der ganze Satz dauert nur wenige Minuten, hat jedoch eine Ausstrahlungskraft, die in keinerlei Verhältnis zu seinem Umfang steht; ebenso langsame Crescendi wie dieses eröffnen einige der bedeutendsten sinfonischen Sätze Bruckners, und die Würdigung Palestrinas ist zugleich ein Blick in die Zukunft, nicht nur in Bruckners eigene, sondern auch auf Werke wie die großartigen Anfangspassagen der Siebten Sinfonie von Sibelius. Das zarte und subtile Benedictus steht in vollständig ausgeführter Sonatensatzform; die Durchführung ist eingehend, die Koda ein strahlender Ausbruch auf „Hosanna in excelsis“. Das abschließende Agnus Dei bietet das übliche dreifache Gebet, jeweils als Crescendo, wobei das letzte verstummt, um für das gedämpfte „dona nobis pacem“ Platz zu machen, womöglich die allerschönste Musik des ganzen Werkes, das zweifellos die tiefgründigste und intensivste Messe Bruckners ist. Die schöne Motette Libera me für Chor mit drei Posaunen entstand 1854. Obwohl Bruckner sie vor seiner lange währenden Ausbildung bei Sechter schrieb, war er damals kein Anfänger mehr: Er war nun dreißig, hatte eine Menge Erfahrung mit Kirchenmusik, und die Behauptung, er sei erst mit vierzig ein richtiger Komponist geworden, ist eine Legende. Schon 1849 hatte er ein schönes und charaktervolles kleines Requiem geschrieben, das es verdient hätte, bekannter zu sein (es ist auf der CD Hyperion CDA66245 eingespielt), und in seinem eigenen Umfeld fand sein Talent bereits Beachtung. Dieses Libera me ist schlicht und prägnant; es verfügt über keinen aufwendigen Kontrapunkt, aber die Stimmführung ist exzellent, ebenso wie die Abwägung der Klänge. Seine ernste Würde ist einem Trauerwerk angemessen, und der Mittelabschnitt bringt die Angst vor dem Jüngsten Gericht mit großer Kraft und Effizienz zum Ausdruck. Die beiden Aequale für drei Posaunen sind die älteste Musik auf dieser CD; ihr Entstehungsjahr ist 1847—damals war Bruckner dreiundzwanzig Jahre alt. Im zweiten der beiden Stücke fehlt die Bassstimme, die von Hans Bauernfeind ergänzt wurde. Die unprätentiösen und ernsten Harmonien könnten für eine Bestattung oder einen Gedenkgottesdienst gedacht sein und bedürfen der auf dieser Einspielung vorhandenen Raumakustik.